Raziya (Radiya in Arabic) was the first and only female ruler of the Mamluk Sultanate of Delhi, ruling during the years 1236-1240. Her reign was extraordinary not only because of her gender, but also because her father chose her to be his successor over her two half-brothers based solely on her merit and intelligence. This choice was highly unusual at a time when in both the Muslim world and Christian Europe women seldom rose to rule principalities, kingdoms, and sultanates; and when they did it was often because there were no legitimate male heirs. 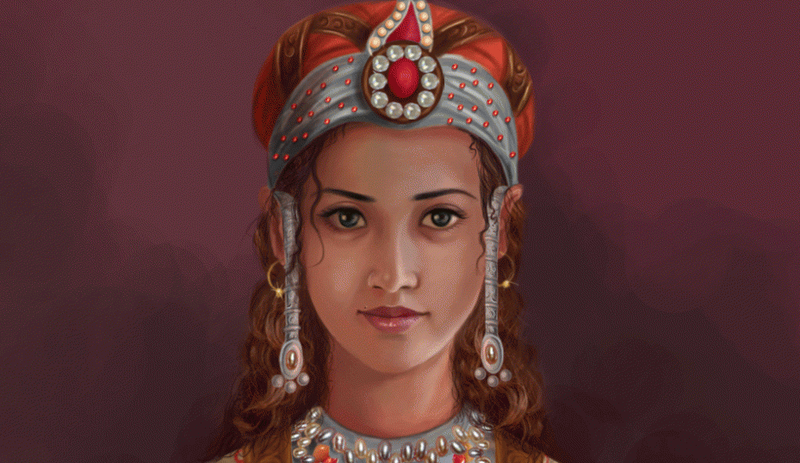 Furthermore, Raziya, in addition to being chosen to succeed her father over her brothers, ruled independently in her own right and was not a puppet through whom powerful men ruled. Raziya was born around the year 1205 to Sultan Shams al-Din Iltumish. Her father was a Turk slave brought to India from the steppes of Central Asia and purchased by Qutb al-Din Aybak, also a Turk and former Slave. Iltumish’s master was the founder of the Mamluk slave dynasty, or more precisely, regime (the rulers of the dynasty were not all descendants of their predecessors and were often either elected to the throne or seized power through force of arms). Iltumish was the greatest of these “slave kings” who really solidified Muslim rule in India. His rise and that of his predecessor from slaves to sultans was an excellent form of propaganda for Islam in India, which was dominated by the rigid caste system, especially to those who were in the lower castes. To these less fortunate members of Hindu society, Islam presented itself as an egalitarian religion that broke down the class structure imposed upon them by Hinduism. It also gave the impression that an individual or group could rise to the top of society, overthrow rulers, and ascend to their position if they had the courage, intelligence, skill, and strength to do so. Iltumish rose to prominence quickly after his arrival to India. At the time that he entered India, his master, Qutb al-Din Aybak was one of the generals of Muhammad of Ghur, the sultan of the Ghurid Empire, which had replaced the Ghaznavids as the dominant power in the eastern regions of the Muslim world during the twelfth century. Sultan Muhammad of Ghur returned west after conquering Delhi in 1193. He left Qutb al-Din Aybak behind to consolidate the region for him. After Muhammad of Ghur’s death in 1206, Qutb al-Din was successful in establishing himself as his successor. Despite being of slave origin, he commanded the army and married the daughter of one of the other claimants to power, and consolidated his position as the ruler of the new Mamluk Sultanate of Delhi. Iltumish was one of Qutb al-Din’s slaves and an officer in his army. He was very energetic and instrumental in helping his master consolidate his rule in India. Qutb al-Din was so impressed with his subordinate’s track record, his excellent service, bravery, skill, and zeal in solidifying Muslim rule in Northern India that he married his daughter to him. Qutb al-Din died in 1210 from wounds he sustained after falling off his horse during a polo game. Iltumish took power a year later. He had already been the governor of a number of cities and districts and had risen to the position of commander of the army. Iltumish was also very diplomatic and it was with the invitation and approval of the nobles and the ulama (the Islamic religious scholars and jurists) that he ascended the throne. It was under this sultan’s rule that Delhi was able to assert its independence from the other parts of the Ghurid empire. Iltumish spent the first few years of his reign consolidating his hold over his domains and fighting off challengers to his rule. One of these challengers was Taj al-Din Yildiz, the governor of Ghazna. Yildiz had seized Lahore after being driven out of his city by the Jalal al-Din and his Khwarazmians, who were fleeing the Mongols. Iltumish defeated and captured Yildiz in a pitched battle in 1215. Iltumish was also able to use his diplomatic acumen to divert Jalal al-Din and his followers from his domains to those of another of his rivals, Kabacha, whose territory they plundered. Having secured his domains, Iltumish set out to expand his holdings and successful conquered Bengal, Ranthambor and Mandawar. He also reduced the rulers of Sind and Daybul to vassalage in 1227. In 1229 an embassy arrived from the Caliph in Baghdad with robes of honor for the sultan and his sons and recognized him as the Sultan of Delhi with the Caliph’s blessing. This was the first time that a Muslim ruler was acknowledged by the Abbasid caliph. Iltumish spent the remainder of his reign expanding his territories and putting down revolts. He was a pious Muslim who respected the ulama and religious scholars of his domains. His court was filled with scholars, poets, historians, doctors, scientists, mathematicians, and philosophers whom he and the other nobles patronized. He also made the administrative apparatus of his empire more efficient and personally attended to matters of justice. In fact, he had a large bell installed at his palace’s gate. Anyone seeking justice from the sultan could ring that bell and summon him to hear their case. It was this energetic and enlightened ruler who named his daughter Raziya as his successor when he was upon his death bed in 1236. Because she was a Muslim and the daughter of a sultan, Raziya was born free (despite the fact that her father was originally a slave). Her father had raised her in a very open manner (one could even mention it was quite “modern”) considering the time period; this is true not only for the Muslim world, but also for Christian Europe, Hindu India, and almost anywhere else during the Middle Ages. Starting his career as a slave and having risen up the ranks through his merit and personal ability may have made Iltumish more open to recognizing a woman’s worth over other men. Furthermore, the fact that he was a Turk who was a member of one of the tribes inhabiting the steppes of Inner Eurasia before his enslavement also played a role in the way he saw the world. In the ancient and medieval periods, women in nomadic pastoral tribal societies often had significantly more rights and played a bigger role in their societies than their sedentary counterparts. Nomadic tribes lived in harsh environments with limited resources; they therefore had considerably smaller populations than the sedentary peoples, and had to utilize all the members of their societies to produce food, resources, and even to wage war and could not afford to confine or seclude their women or to relegate them to sidelines as was the case in other societies. Therefore, Iltumish, who saw the potential in his daughter, chose her to succeed him over his sons. In fact, Raziya had attained some experience in politics, having been appointed to govern Delhi while her father was leading military campaigns. When asked about his choice by his confidants, the Sultan had said that his sons lacked the characteristics required for leadership that he recognized in his daughter. Despite the dying Sultan’s choice, his courtiers and the commanders of the army did not share his high opinions of his daughter and his wishes were ignored. Raziya’s half-brother, Rukn al-Din, was raised to the throne shortly after Iltumish’s death. Rukn al-Din had another of his half-brothers who had claimed the throne killed to intimidate Raziya and to force her back into the harem. Furthermore, he embarked on a life of decadence and debauchery and the true power behind the throne was his mother, Shah Turkan, who used her new power to wreak vengeance on all of her personal enemies and rivals. Rather than slink away in defeat or go into hiding out of fear for her life, Raziya decided to appeal to the people of Delhi to support her. In fact, she used one of her father’s policies to gain the attention and the support to regain her throne. According to the sources most of the commoners of India wore white garments during this era. In addition to having the bell installed at his palace for those people seeking justice, Iltumish also instituted a policy whereby anyone seeking justice from the Sultan should wear dyed clothes, so if the Sultan was abroad and saw anyone wearing colourful clothes, he knew that that individual was oppressed and required justice and personally listened to his/her complaint. At this low point in her life, Raziya donned red garments and walked among the people and appealed to them for aid against her brother. She had been unjustly removed from her throne that was bequeathed to her by her father, their beloved and just Sultan. She publicly presented herself as a victim of injustice and proclaimed her charges against Rukn al-Din, also charging him with the murder of her other half-brother. Raziya appealed to the people to defend her from Rukn al-Din, who was now also threatening her life. She carried out her plan on Friday, the day when most Muslims were gathered in the mosque and other public places in order to maximize the publicity of her message. Raziya’s plan worked and the people who heard her speak, many of them members of the army, supported her claim. Rukn al-Din was deposed and killed and Raziya was returned to power. These are significant because minting coins was one of the signs of sovereignty and rulership in the Muslim world. The first of Raziya’s inscriptions emphasizes her power as a woman; the second inscription legitimizes her rule under the reigning Abbasid caliph as his loyal supporter. After ruling for four years several members of the army rebelled against Raziya and deposed her in favour of another half-brother, Bahram Shah. There are a number of possible reasons for this uprising against the Sultana. Fatima Mernissi argues in her book The Forgotten Queens of Islam that Raziya was overthrown because she fell in love with a lowly Ethiopian slave whom she promoted to a high post at court too rapidly. Her enemies were watching her closely and witnessed this slave help Raziya mount her horse by placing his hands under her armpits and lifting her up. Such a familiar gesture and such physical contact between a ruler and an inferior slave was deemed unethical and as the rumour of the affair between the two spread, Raziya’s name was tainted. Other theories state that there was always an animosity among the more conservative traditionalist Muslim scholars and their supporters against the idea of a woman ruling and they had always preferred a male ruler and had gathered support for their cause over the four years that Raziya ruled. Razia fled Delhi with those troops who still supported her. She was pursued by the rebel army under the leadership of one of the amirs Ikhtiyar al-Din Altuniya. Altuniya caught up with the fleeing Sultana and a pitched battle was fought between the two sides. Raziya’s forces were defeated and she was taken prisoner. It was not long before Altuniya himself fell in love with his prisoner and pledged his support to Raziya. He freed her and the two of them got married before they mustered their forces and marched on Delhi together. However, the army sent out to meet them from Delhi routed their forces. There are two accounts of Raziya’s subsequent death. In the first she fled the battlefield after her forces were defeated. Plagued with hunger and thirst she approached a farmer tilling his fields and asked him for help. He gave her some bread and water, which she ate and then she fell asleep. The farmer noticed the rich jewel studded gown underneath her armour as she slept and it was at that point that he realized she was a woman. He murdered her while she slept, drove away her horse, despoiled her of all her valuables, and buried her in his field. The farmer immediately drew the suspicion of the local magistrate when he attempted to sell his stolen goods in the local market and a confession was quickly beaten out of him. Raziya’s body was disinterred, washed and reburied. In the second, but no less dramatic, account Raziya and Altuniya were captured and both put to death by Bahram Shah after losing the battle for Delhi. Ibn Battuta visited her grave site, which is on the Yumuna River, and states that the people in the region had made her into a saint and erected a dome over her burial place which was visited by supplicants who pray there for blessings. Adam Ali is a lecturer at the University of Toronto. Click here to read more from him.